FleetWit has awarded over $1,000,000 in real CASH and prizes to players of trivia, puzzles, and more! 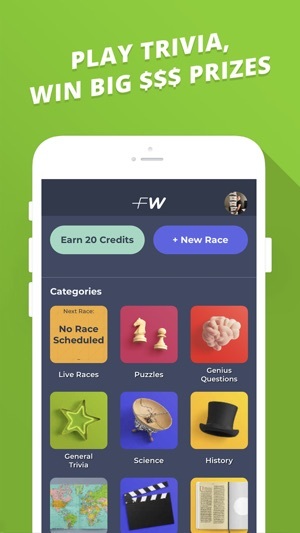 FleetWit now features more prizes than ever with live races every hour and prize pools that grow as more users join. Or play head-to-head in one of 200+ trivia categories or puzzle games at any time. FleetWit is like a game show at your fingertips… 24/7. So what are you waiting for? Go win some money already! Any other questions or concerns? Email us hello@fleetwit.com and we’d love to help you out. Follow us on social (@fleetwithq) for helpful hints, clues, and entertaining videos to keep your mind sharp throughout your FleetWit experience! Improved Live Race UX. Enjoy smoother gameplay and checkout! I’m a big fan of trivia games and I’m always looking out for new ones to play. I came across Fleet Wit in the App Store and was eager to try it out. The app is pretty straight forward and easy to navigate. There are a wide-range of categories and subcategories to choose from and the questions I have to say can be a bit challenging. I thought I was pretty good at trivia until this game gave me a run for my money - literally! It took a couple of “races” to get the hang of it, but overall I find the game to be quite enjoyable to play. I like the fact you are playing against other people and the live events are a nice feature. I also like that fact you can choose the price point on a challenge or race as they call it here. So, if I feel daring and want to try for a bigger pot I might go for a 20 credit game or I can play it safe and play a 4 credit game for a smaller earning potential. The one thing I would like to see is a way to earn credits, such as submitting questions and for each approved question, you earn a credit. Well, I’m off to the races. 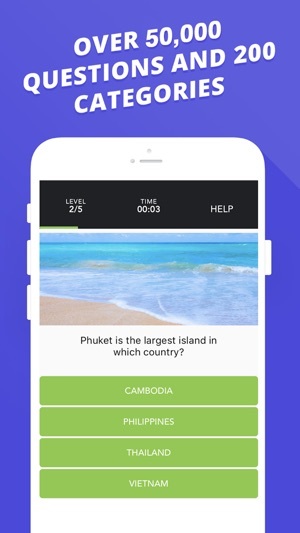 Tried out the app because I love trivia and I loved the concept. But the fact of the matter is, taking a 20% cut of deposits (which actually means a 40% cut of the winnings since it’s taken from both participants) makes it nearly impossible to come out ahead. You need to win 63% of the time just to break even. On top of that, the credit system is wack and is just another way to force you to make more deposits. You deposit cash and then convert it into credits to use in games, but you have to deposit and convert at least $5 at a time. So if you have a $4 balance tough luck - you’re gonna have to deposit another $5 just to be able to use the $4 balance that’s already there. But they don’t stop there - next comes the cash out where you’re required to have at least $10 and are then charged ANOTHER fee of $0.25 plus 2.5%. I get that they need to keep some money to run the platform and create content, but an app like fanduel does this perfectly while taking less than half of what FleetWit is pocketing. But as long as you’re aware that you’re going to need to win 70% of the time to make money it’s fun. Hello! We take a 20% cut of the total amount. 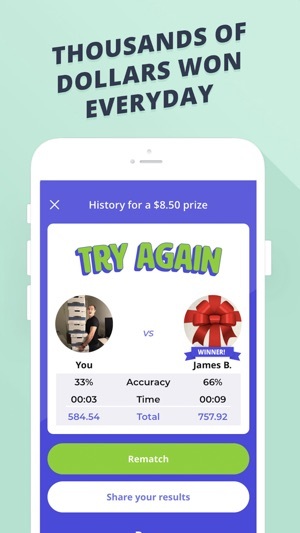 As we're the only on-demand trivia app that (1) writes all of our questions in-house and (2) only allows you to see each question once, we believe that this pricing is very fair. We set those $5 and $10 limits as a way to ward off people trying to game the system - it is our way to safeguard our community against the small amount who try to game the system (key word: try). PayPal incurs those fees - we had to choose between multiple payment structures. For the majority of our users' sake, we chose the option with the lower fees. You mention FanDuel, who actually don't create any of their content - their content is what happens on the field that week. Please feel free to respond/reach out with any other comments or concerns - we appreciate hearing what our players are saying! I have always been a fan of trivia games whether it’s at an old Irish bar or during a fundraiser. I was excited to come across FleetWit. There are challenges to be played at around 8 p.m which I anticipate for. I was able to pick out a topic I enjoyed and I chose History. I really enjoyed the color scheme of the game as well as the questions presented. None of the questions were too easy or difficult-just the right amount of challenge. There isn’t much time to answer the questions, however it helps you follow your gut feeling which I enjoy. You can also buy more credits to play other games outside the game time as well. The prices are reasonable but I say practice first! I already won a little money that I can save or cash out as well. I look forward to playing this trivia game more and sharpening my skills! Thanks for the feedback! Happy racing!